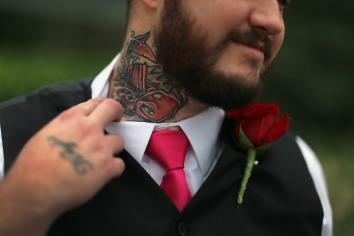 Google's Motorola Mobility division files patent for lie-detecting neck tattoo. This is not what a Google lie-detecting neck tattoo would look like. Plus, it wouldn’t require needles. Did you hear? The Register reported late last week that Google wants to hold us all down and tattoo electronic microphones on our necks. Even better, the tattoos will double as lie detectors! Just wait until the Scroogled guys get a hold of this one. According to the patent application, the microphone tab would enable better hands-free, wireless communication in a crowd—which actually makes a lot of sense for security personnel, spies, or event planners. What makes less sense is Section 0027 of the patent application, which mentions the optional “galvanic skin response detector.” By detecting skin resistance (read: sweat), Google’s skin tattoo may be able to determine whether its wearer is “nervous or engaging in speaking falsehoods.” Since I can’t imagine why the Sam Hill someone would opt to wear such incriminating technology, I think we have to assume the tattoo would either be applied clandestinely or against the wearer’s will. Let’s not even get into the dubious quality of truth-telling based on “skin resistance” alone. As Alexis Madrigal points out at the Atlantic, this is just a patent, and patents rarely make it all the way to becoming products. (If this weren’t true, we’d obviously all be wearing Gerbil Vests.) Furthermore, if recent revelations about tech patents and patent trolls have taught us anything, companies submit, stockpile, and sell patents for numerous reasons that don’t directly result in application. Maybe Motorola’s only really interested in part of the patent—like the technology that can tether voice commands to smart phones, tablets, or game consoles (Section 0013). Or maybe it’s interested in streamlined emergency response technology (Section 0033). Or quite likely, they’re developing something vital to better communication that’s so boring, people like me won’t even notice it in the 4,000-word document. One thing’s for sure, this is unlikely to help Google’s ongoing issues with privacy and consumer trust. I mean, say what you will about Apple, but a symphony and a Jeff Daniels voice-over beats poorly named patents for Orwellian neck tattoos any day.